The Giant Mine site is currently under care and maintenance administered by the Giant Mine Remediation Project Team. Since 2014, the Project team has worked towards its submission of a formal application for a Water Licence to the Mackenzie Valley Land and Water Board. 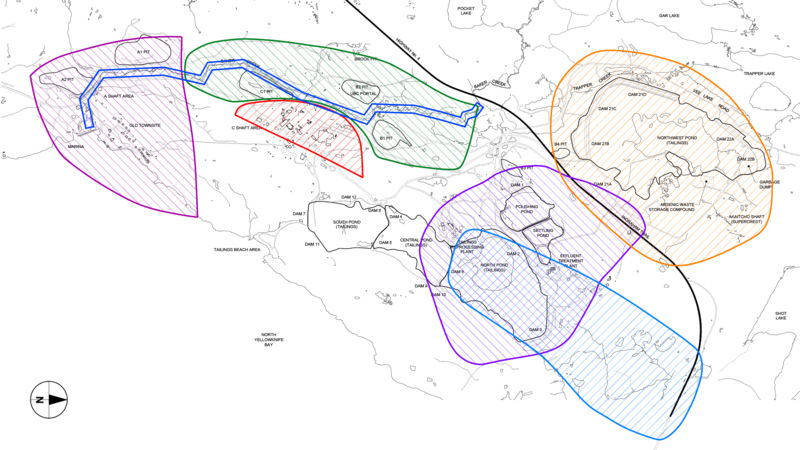 A draft Closure and Reclamation Plan was provided to stakeholders for review in mid-2018. The Project Team addressed the submitted comments and completed the application package in early 2019, sharing it with the public until they formally submitted it to the Mackenzie Valley Land and Water Board on April 1, 2019. Note that there are 7 parts to the package. By selecting the links next to each of these, reviewers can enter and submit comments, proponents can respond to comments, and Board Staff can provide responses related to the items for review. Giant Mine is located approximately five kilometres north of Yellowknife, NT lying within the city limits and in close proximity to the communities of Ndilo and Dettah. 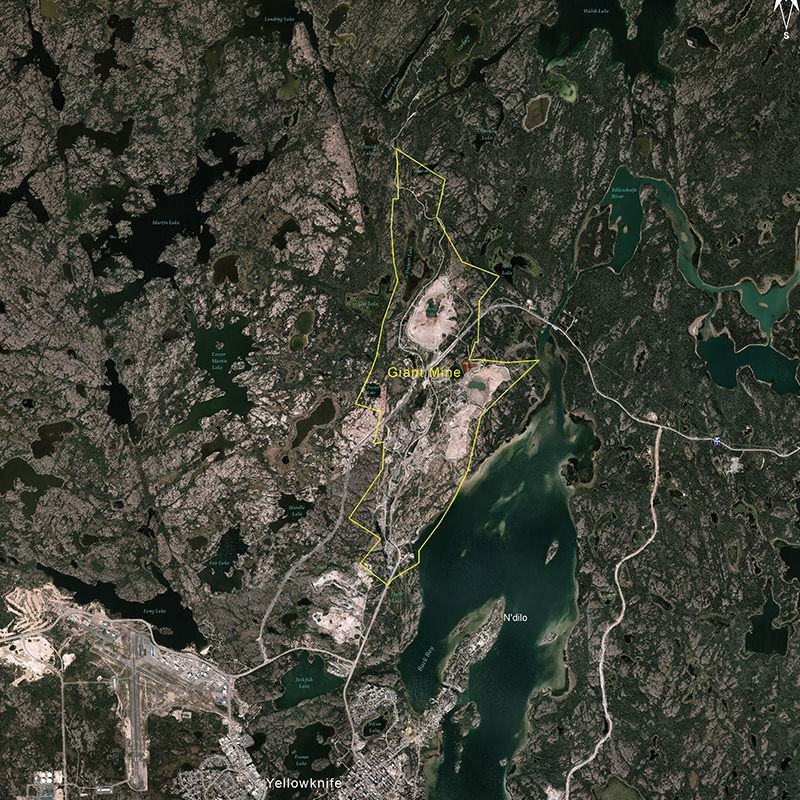 The site lies on the north shore of Yellowknife Bay, part of Great Slave Lake and in close proximity to numerous creeks, rivers, ponds and small lakes and is considered to include everything within the boundaries of the former lease in place during the operational period of the mine. Two impacted areas immediately outside of the lease area are also considered to be part of the site. They are the Giant Mine “townsite”, which was removed from the surface lease in 1999 and an area of historic tailings deposition along the shore of North Yellowknife Bay. Gold was found on the Giant Mine site in 1935 but a commercial ore body was not confirmed until 1944 when a massive gold-bearing shear zone was uncovered beneath the Baker Creek Valley. The Burwash Mine, Con Mine and Negus Mine were all developed in the area before the Giant claims entered into production. Giant Yellowknife Gold Mines Limited poured its first gold brick on June 3, 1948, and the mine, under various owners, remained in operation until 2004 generating over seven million ounces of gold. Ownership of the mine moved through the hands of a number of companies: Giant Yellowknife Mines, Ltd. (a subsidiary of Falconbridge (1948-86), Pamour (1986-1990), Royal Oak Mines (1990- 1999) and Miramar Mining Corporation (1999-2004). When Royal Oak Mines went bankrupt in 1999, the Government of Canada became responsible for cleaning up the Giant Mine site and allowed Miramar Mining Corporation to haul ore from the site to its mill at Con Mine until Giant Mine was finally closed in 2004. Over the lifetime of Giant Mine, 237,000 tonnes of arsenic trioxide dust were collected and stored in fourteen underground chambers at the mine site. The Giant Mine Remediation Project’s primary goal is to protect human health and safety and the environment. To do so, the project is focused on the long-term containment and management of the stored underground arsenic trioxide waste, demolition and removal of on-site buildings, water management and treatment, and the remediation of all surface areas including the tailings ponds at the Giant Mine site. As a result of their shared responsibilities for the Giant Mine site, Indigenous and Northern Affairs Canada (INAC) on behalf of the Government of Canada and the Government of the Northwest Territories (GNWT) are the Co-Proponents of the Giant Mine Remediation Project. The Giant Mine Remediation Project is funded through the Federal Contaminated Sites Action Plan. The Giant Mine Remediation Project Team involves staff from INAC, Public Services and Procurement Canada and the GNWT. Given that the Giant Mine site is subject to the jurisdictional authority of both the territorial and federal governments, a Cooperation Agreement Respecting the Giant Mine Remediation Project (March 15, 2005) established that INAC and the GNWT, as Co-Proponents, would implement a care and maintenance plan for the site that protects human health, public safety, and the environment. In 2015 the Cooperation Agreement Respecting the Giant Mine Remediation Project was renewed. The Cooperation Agreement also outlined the financial responsibilities of the federal and territorial governments regarding site care and maintenance and cost sharing for surface remediation. INAC is responsible for the management of the arsenic trioxide stored underground at the Giant Mine site. The Giant Mine Remediation Project Team consults with the public, First Nations, Metis, and various stakeholder organizations through a number of means including formal public meetings and presentations as well as regular meetings of the Giant Mine Working Group (GMWG). For more information on the Giant Mine Remediation Project Team. The Giant Mine Oversight Board has been invited to observe the work of the following Committees involved with the Giant Mine remediation process. The Giant Mine Working Group (GMWG) was formed in August 2013. This working group provides a forum for interested parties to discuss and make recommendations on technical, operational and project activities regarding the remediation of Giant Mine. Its members include Indigenous and Northern Affairs Canada (INAC), Public Works and Government Services Canada (PWGSC), Government of the Northwest Territories (GNWT), Environment Canada (EC), Department of Fisheries and Oceans (DFO), Alternatives North (AN), Yellowknives Dene First Nation (YKDFN), North Slave Metis Alliance (NSMA), Health Canada (HC) and the City of Yellowknife. GMWG is co-chaired by the GNWT and AANDC and meet monthly. The Health Study Advisory Committee (HSAC) was formally established in June 2016. Its purpose is to provide advice and make recommendations to the Principal Investigator and the Project Team in the development and implementation of the Health Effects Monitoring Program Advisory Committee (HEMPAC) by utilizing expertise and knowledge of regional and community level issues. Its member includes Indigenous and Northern Affairs Canada (INAC), Government of the Northwest Territories (GNWT), the Chief Public Health Officer GNWT, Health Canada, City of Yellowknife, Yellowknives Dene First Nation (YKDFN) and the North Slave Metis Alliance (NSMA). Meetings are held when required, with an attempt to schedule two face-to-face meetings per year. The Giant Mine Remediation Project Team (GMRP) is responsible for coordinating these meetings. Through the Giant Mine Advisory Committee (GMAC) the Yellowknives Dene First Nation (YKDFN) are able to express concerns they have about the project and receive updates about the project from the Giant Mine Remediation Project Team (GMRPT). The GMRPT is, in turn, able to obtain traditional knowledge input and receive feedback on the design of the remediation plan from YKDFN. This committee meets monthly and is coordinated by the YKDFN. The Communicating with Future Generations (CFG) Working Group was formed in February 2015 but no longer meets. It was established to facilitate information sharing among key stakeholder and the governments managing the site, with a focus on strategies for communicating with future generations about the management needs of the site. Its membership included the Yellowknives Dene First Nation (YKDFN), North Slave Metis Alliance (NSMA), Indigenous and Northern Affairs Canada (INAC), Government of the Northwest Territories (GNWT), the City of Yellowknife and the NWT Mining Heritage Society. The Toxic Legacies Project coordinated these meetings. Giant Mine Community Alliance was established as a community liaison committee in June 2003 by Indigenous and Northern Affairs Canada (INAC), to assist the public by sharing information about the project and relaying public concerns and issues about the remediation of Giant Mine. This Committee is not currently active. Its membership included the Yellowknives Dene First Nation (YKDFN), North Slave Metis Alliance (NSMA), Public Health GNWT, NWT Mining Heritage Society, Ecology North, Northwest Territories Federation of Labour, Yellowknife Chamber of Commerce, City of Yellowknife, Government of the Northwest Territories (GNWT) and Indigenous and Northern Affairs Canada (INAC). The Giant Mine Remediation Project Team (GMRPT) Team coordinated these meetings when required.